Thailand Expat Chess Challenge 2013 is the tournament held alongside the Thailand National Chess Championship 2013. The tournament is open only to players without Thai nationality who reside in Thailand. 2.1 This Tournament is a 7-round Swiss System. Pairings shall be done by suing the Swiss Manager Program. 2.2 Each player has 90 minutes to complete the game with 30 seconds increment for each move, starting from move one. 2.3 Any player who fails to be present within 60 minutes after the game has started shall considered lost by default in that round, and if he/she is declared lost by time default for two rounds, he/she shall not be paired to play in the rest rounds of the tournament. 2.4 Any player who misses any round of play will not be paired in the following rounds, and may be considered to have withdrawn from the tournament, unless he/she notifies the Chief Arbiter well in advance. 2.5 A player must record his/her moves and of his opponent no matter how much time he has left on the clock and hand over the score sheets to the Arbiters at the end of each round. In the case of a draw, players with White shall deliver the score sheets to the Arbiters. 2.6 FIDE Law of Chess shall apply. Results will be sent to FIDE for rating calculations. 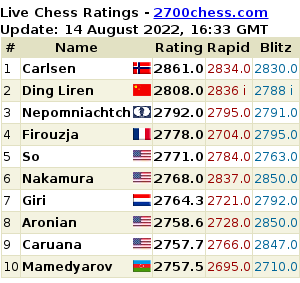 Only players with FIDE ID No. can enter to play in this tournament. If any player has no FIDE ID No. just yet, please contact your Federation to apply for FIDE ID. 2.7 Players are not allowed to bring mobile phones or other electronics devices into the playing area. Failure to comply with this rule shall result in losing the game. 2.8 Arbiter’s decisions are final. 2.9 The Organizer shall have the rights to change the regulations without notifying the players. 2.10 The Organizer reserves the right to adjust the prize money and other prizes as well as other tournament regulations according to the circumstances and suitability. 3.1 Trophies shall be awarded for the three top positions. If players are tied for position(s), then the tie-break according to Article 4 shall be used. Players who wish to participate in the tournament can complete the registration form by 30th October 2013. Late registrations shall only be allowed to play from round 2 onwards. Lotus Room, 2nd Floor, Queen Sirikit National Convention Center, Khlong Toei, Bangkok. Chief Arbiter IA Panupand Vijjuprabha, Deputy Chief Arbiter NA Patcharawee Bhramawong.